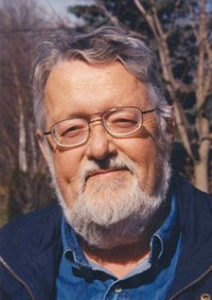 Joseph Alexander Torbay – Peacefully, surrounded by his family at the Cambridge Memorial Hospital, in his 69th year on October 10, 2009. Beloved husband of Edith (nee Flippance) of 43 years. Devoted father to Christopher (Danielle) and Michael (Maral). Loving grandfather to Jordan and Miranda. Cherished son of Eva. His humour, opinions – and voice – will be missed by many relatives and friends. The family will receive guests at the T. LITTLE FUNERAL HOME, 223 Main Street, on Thursday October 15, 2009 from 7-9 pm. A Funeral Service will be held in the chapel on Friday October 16, 2009 at 2 pm. Donations may be made to the Kidney Foundation. Online condolences can be made at www.tlittlefuneralhome.com. Besides being a radio personality Joe was also a Canadian puppeteer and television personality. He was best known for puppeteering the characters of “Gronk”, “Harvey C. Wallbanger” and Grammar Slammer’s “Bammer” in the television series The Hilarious House of Frightenstein. Click on any of the 3 panels below to open up a youtube video. Gronk – A purple sea serpent who interacts with the Count or the Wolfman. Gronk would announce his presence with a loud call of “Gronk!” Gronk’s segments usually had the Count reading a book; the Count would then start explaining what the book was about, with Gronk interrupting him, usually mid-sentence, with a completely incorrect conclusion to what the Count had been reading. This would happen several times, leading to greater and greater frustration on the part of the Count. Segments with the Wolfman were generally one-line or two-line jokes. Harvey C. Wallbanger – The postmaster of Castle Frightenstein’s “dead letter office”, he would appear in sketches with The Count or Grizelda in which they answer letters. Bammer – A large purple monster who assisted the Grammar Slammer in correcting Igor’s poor grammar.